I guess it has been a few weeks since I last posted and decided it was time to write again! Over the past few days it was nice to finally enjoy being outside in the sunshine and warmer weather. While it may seem like this year's winter has been one deep freeze after another, it won't be too long before the signs of spring will make their appearance. With spring comes a plethora of beautiful bulbs and colours that slowly break up dull winterscapes. In the studio, we have already had the chance to work some of the spring flowers....which have definitely brought a lot of colour to the dreary winter days! 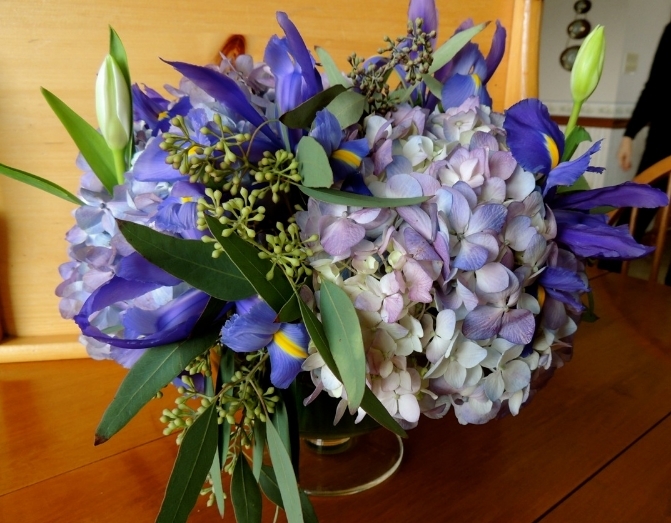 Classic table arrangement with tulips, iris, hydrangea, and eucalyptus.